"A Roland for an Oliver!" Saving the passing reference by Scott and Milton, quoted above, Roland and Olivier are almost unknown to English readers, and yet their once familiar names, knit together for centuries, have passed into a proverb, to be remembered as we remember the friendship of David and Jonathan, or to be classed by the scholar with Pylades, and Orestes of classic story, or with Amys and Amylion of romance. Who fell at fatal Roncesvall." Turning to the historical data on which the romance is based, it will be found that in the year 778 a.d. Charlemagne, accompanied by his nephew, Count Roland of Bretagne, and the flower of Frankish chivalry, made a raid across the Spanish border. Abdalrahman, the first of the great Spanish caliphs of Cordova, was engaged in putting down the rebellious chiefs who had refused to own their allegiance to the new caliphate. The frontier was therefore comparatively unprotected. The Spanish Christians, who maintained a precarious independence among the Asturias and Pyrenees, and who found it the wisest policy to be at peace with the Mohammedan rulers, were not strong enough to resist Charlemagne. Accordingly the Franks advanced nearly to Saragossa. 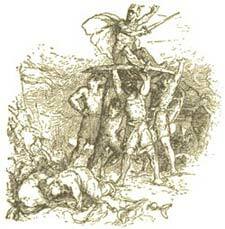 On returning to France laden with spoil through the winding defile of Roncesvalles (the valley of thorns or briers), their rear-guard was cut off by a band of Basques or Gascons and Spanish-Arabians, and their leader, Roland, slain. To the presence of these Spanish Christians in the Moorish army must be attributed the origin of the many Spanish ballads on the victory, in which all the glory is due to the prowess of the national hero, Bernardo Del Carpio, "the doughtiest lance in Spain." It is curious also to note, on the other hand, that the Arabians themselves in their chronicles, translated by the Spanish historian Conde, make little of this victory, merely mentioning the fact. The Saracen King Marsil, or Marsilius, of Saragossa, so often referred to in this and other Carlovingian romances, is identified by Conde with the Mohammedan Wali, or Governor of Saragossa, Abdelmelic, the son of Omar, called by the Christians Omarus Filius, hence the corruption Marsilius. With these brief outlines of the history of Roncesvalles before us it is interesting to observe the grandiloquent strain of the old Norman rymours, the fearless exaggerations, and the total ignorance of the actual state of affairs in Spain under the enlightened and accomplished Arabians. Set anz tut pleins ad estet en Espaigne." To seek the lord of the Frankish land." Their gentle spouses and damsels fair." But their great chief is silent and gloomy. 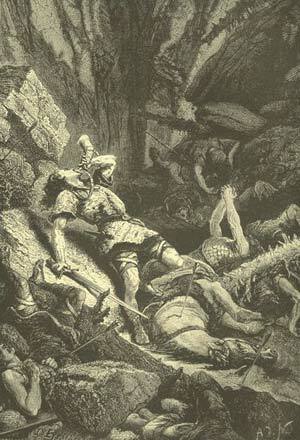 Roland, the bravest of the brave, has been left behind with all the paladins, save Ganelon, beyond the gates of Spain. Last night the emperor dreamed he seemed to stand by Cizra's pass in Roncesvalles, when Ganelon appeared before him, wrenched the emperor's spear from out his hand, waved it on high, then dashed it in pieces. What did it mean? He remembered the ominous words of his peers, "Evil will come of this quest, we fear," and Ganelon's strange reply, "Ye shall hear." Meanwhile Sir Roland was far behind in Roncesvalles. He rode his gallant steed Veillantif; his white pennon, fringed with gold and set with diamonds, sparkled in the sunshine; and by his side he wore his famous sword Durindana, with its hilt of gold shaped like a cross, on which was graven the name of "Jesus." What a glorious picture of the Christian hero of mediaeval times! With him were Olivier, the good Archbishop Turpin, and the remaining knights who made up the Order of the Paladins of Charlemagne, together with an army of 20,000 men. The drums beat to arms in Saragossa's town, the tambours roll, the tabors sound, and 400,000 men attend the call of King Marsil. From a neighboring height Sir Olivier observes this countless host approaching. He calls to Roland to blow his ivory horn and bring back the emperor. Roland refuses, and the Franks prepare to fight; not, however, before on bended knee they receive the archbishop's benediction and a promise of paradise to all who die in this holy war against the pagan foe. With the old French battle-cry, "Mont-joie! Mont-joie!" the Christians dash the rowels into their steeds and close with the enemy. Homer does not relate a bloodier fight than that which follows, and which takes eighty-six stanzas, or fifty of Mr. O'Hagan's pages, to describe. Again and again the Christians charge the Saracens. What deeds the great sword Durindana did that day! The slain lie in thousands; the Saracens flee; and in the pursuit all are killed save one, who reaches Saragossa. The triumph, however, is short-lived; Ganelon had decreed that Roland must die, and so a mightier army than before marches forth to exterminate Roland's handful, now reduced to 300. During this battle a terrible storm passes over France,--thunder and whirlwinds, rain and hail, there came. "'Hast thou done it, my comrade, wittingly? Roland who loves thee so dear am I. But I see thee not; God seeth thee. And in love like this was their parting made." And thou hast never done me wrong. Since thou art dead, to live is pain." "And the heathen cries, 'What a felon three! Look to it, lords, that they shall not flee.'" One who should never in battle swerve." Where unremitting frost the rocky crescents bleach." One of His angel cherubim." St. Michael it was, who with St. Gabriel bore his soul to Paradise. It would be too long a story to tell of the vengeance of the Emperor Charles, how the sun stood still till the Franks had killed every one of the Saracens; how Ganelon was accused of treachery, tried by combat, and sentenced to be torn to pieces by wild horses. The story is a true tragedy, terrible as the tragedy of OEdipus. From another source we gather the mournful sequel. Long before the battle of Roncesvalles Roland and Olivier had met in single combat on a quiet island in the Rhone. Toward even a fleecy cloud hovered over them, and from its midst an angel "wrapped in rosy light" separated the combatants, bidding them be friends, and telling them to turn their swords against the enemies of the Faith. The heroes shook hands, the angel vanished, and from that day there were no truer friends than Roland and Olivier. Their union was further cemented by the betrothal of Roland to the Lady Alda, Sir Olivier's sister, a maiden who had already, in Roland's presence, proved herself as bold in war as she was loving in peace.